Firstly apologies for the bad picture, I just couldn't get the lighting right tonight (serves me right for moving things around!!) I'll take another picture tomorrow once my hubby has sorted my lighting mess for me lol. 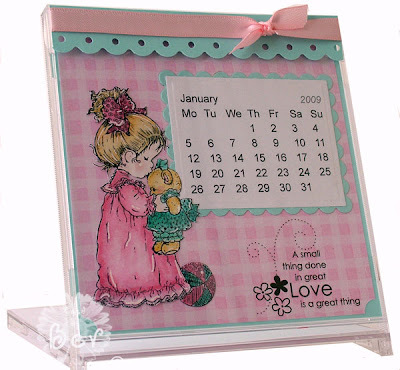 This is another of Katharina's gorgeous fantabulous new release stamps! Isn't Willow just gorgeous!!! I love the sentiment too, another one of Katharina's gorgeous stamps! Wait till you see all the sentiments, you won't know which one to use first!!!! Don't forget they go on sale on the 4th October. 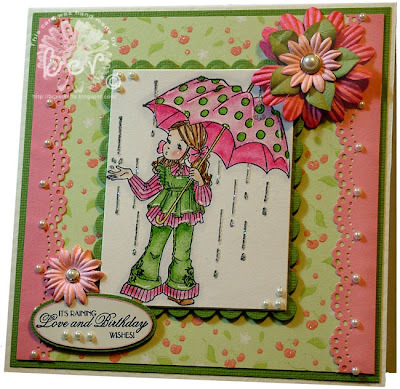 I'm entering this in the Spoonful of Sugar challenge, which is such a stunning sketch by Camilla - I love it and have already made another card using it lol. Check out my side bar for news of more blog candy - Fran has some up for grabs this week and you so don't want to miss it!! Jeanette also has some delish blog candy up for grabs to celebrate 10,000 hits. Don't you just love this little guy - as soon as I opened my DT package from Katharina and saw Charlie all dressed to kill I just had to ink him up. James Bond eat your heart out!! 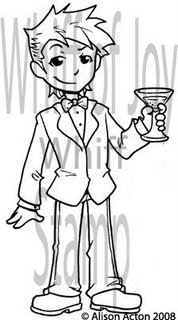 Isn't this stamp just the perfect image for a mans card - see I told you so lol. 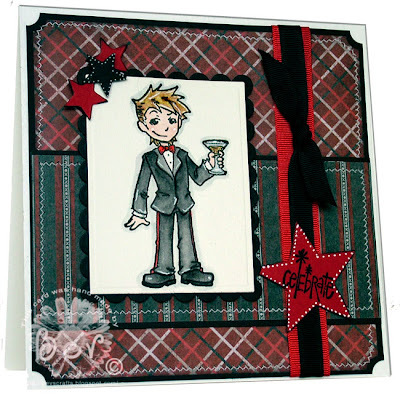 I am entering this card in the Dutch Dare challenge - make a card for a man and also the OCC challenge which is stitching. I have a couple more previews to post but need to finish the cards off properly first - hope to get them all posted tomorrow. Stars are a Sizzix die. Don't forget to check out the other DT members blogs for more previews, they have all outdone themselves, fantastic cards girlies!!! Another challenge combo AND!! Whiff of Joy stamps are back in stock!! I had to post this!! I've just been checking out Whiff of Joy website and all your favourites that were sold out are back in stock so go and fill your boots here girlies!! Don't forget the release date for the new stamps is the 4th October and from tomorrow the DT will be releasing cards made with some of the new stamps. I love them!! Mens cards are so difficult but these new babies will make it so much easier ...... so keep watching. Now, for another challenge combo - I'm starting to catch up a little. This card is for the ABC challenge which is J = Jewels this week and believe me I don't think I could have fitted any more jewels on this card lol. I used the sketch on Stamp with Sarah Kay this week, it's a brilliant sketch and one I will use again and again. Flowers - mostly just punches which I have stamped with a script stamp and moulded with a ball tool. This weeks challenge is True Blue and the DT cards are just gorgeous! 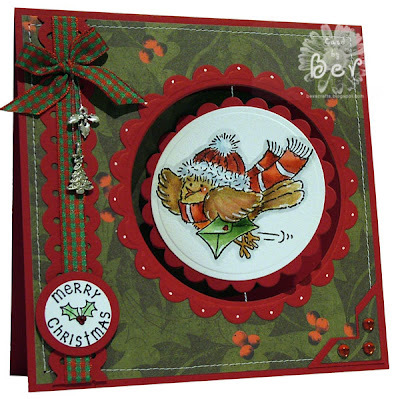 This is another very quick card literally thrown together early yesterday morning. I had planned on stitching but ran out of time. Brads, charm and lace from stash. I'm back!! I think I need counselling after not being able to craft for a WHOLE WEEK lol. My craft room is all done, my lovely hubby made such a brilliant job and I now have loads of storage and everything has a place. You would not believe what I threw out - the wheelie bin is full and it was only emptied on Friday. Our Ben's school is going to love him on Monday as there is piles and piles of stuff (most of it new and unopened) that he can take in for the bairns to use. I used the fab Ismaki sketch this week, the charms fulfil the Spoonful of Sugar challenge and Cute Card Thursday is sparkles - well I think Santa's beard more than fulfills that criteria lol. 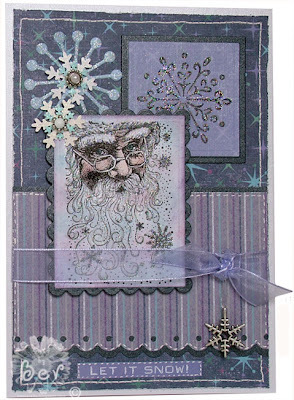 I used Rubber Stampede Santa Collage stamp, coloured with distress inks. 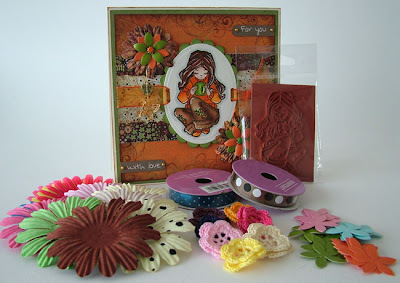 Don't forget the Whiff of Joy guest DT call ends soon, check out Katharina's blog. Here's a couple of sneak peeks that are going to be released on the 4th October (hoo boy! That's gonna be a looooooong wait lol). Have you ever seen anything as gorgeous as this Angel boy - the expression on his little face is just too precious!!! Ooooh I can't wait!!! And as for Charlie, well isn't this just the perfect stamp! Men's cards are soooo hard to make and just think what you could do with this little baby. Congrats cards, birthdays, New Year, the list is endless! No candy from me lol, but I need to apologise for being such a bad blogger this week and to thank you all for your comments, I am trying to visit as many blogs as I can tonight and will hopefulle be up to date by the weekend. My craft room is almost put back to rights, just waiting for two new cupboards to be fitted and a set of drawers assembled so I can put my stamps away. I have had such withdrawal symptoms (I;ve been walking around like a bear with a sore head lol) and can't wait to get a card made again. Now to the blog candy - Michelle from Donkey Smiles is offering the most amazing blog candy for hitting 25,000 visitors so get yourself over to her blog and enter if you haven't already. I've not seen such adorable stamps like those on offer - totally too cute!! Woohoo - how cool does it feel to be posting this!! We're up and running with our first challenge which is a spectacular sketch by the very talented Katharina from Whiff of Joy. I do hope you will join in with the challenge - the prizes, yes plural!!! are fantastic so please pop over and take a peek. And if you think this weeks prizes are good, just you wait to see what's on offer next week! Whoops, just noticed the strawberry charm is skew whiff in the photo - serves me right for not checking (but I have a good excuse - my hubby is reorganising my craft room and everything is upside down - I had about an hour to make this card, sat on the top step working on my lap so please forgive the pic!!!) I can't believe just how much stuff I have (she says whilst blushing beetroot ). My bedroom is full, the spare bedroom is full, as is the landing, the bathroom and a large portion of the garage. How on earth I am ever going to find anything after this is beyond me. The Whiff of Joy image - Melinda Reading is coloured with Distress Inks and Twinkling H2O's. I had to work late tonight so Ben was unable to draw the winner. Sooo, I used a random generator - Truly Random Number Generator/Picker, and number 33 is the winner. That blog candy looks fantastic! I will put a link on my blog and keeping my fingers and toes crossed! Congratulations Lynsey, please email me (link in the side bar) with your address so I can get your prize off to you in time to enter the first Whiff of Joy challenge lol. Please go and take a look at the rest of the DT's work - so creative and inventive. Don't you just love these stamps!! I can see me buying them all lol. 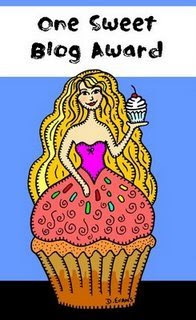 I've done this card for Cute Card Thursday challenge which is food, and Dutch Dare challenge which is no square edges on your card. The papers are from the Winter Wonderland Collection that I got from The Hobby House. The images are coloured with Distress Inks and H2O's. No card today but some fab news!! There is now a Whiff of Joy challenge blog up and running!! The first challenge starts on Wednesday 24th September! Click on the banner to go to the blog for all the details. So don't forget to get your Whiff of Joy stamps at the ready - Katharina has done a fantabulous sketch for the first week and you all know how much I love her sketches lol. I've two cards to post tonight, Papertake weekly has another fabulous sketch from Katharina - her sketches ROCK!! I just love working with them and this one is one I will use over and over. 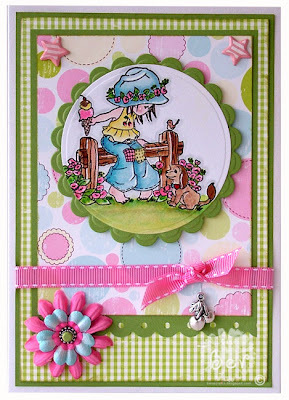 The Sugar Nellie image is from the Hobby House which I coloured with distress inks and H2O's. Papers are Making Memories Garden Party also from The Hobby House. Their website has a limited range and does not anywhere near show what they have in stock but an email or phone call to Jill will usually have what you want to you by the next day. Ribbon is from my friend Sally. The border punch is Fiskars Threading Water. 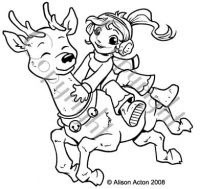 The Spoonful of Sugar challenge is to make a Christmas card so I've done this one and not used any papers!! Must have lost the plot when I started on this one lol. The picture is not a very good one but is the best of a bad bunch. The snowflakes are not showing on the background around the tree. 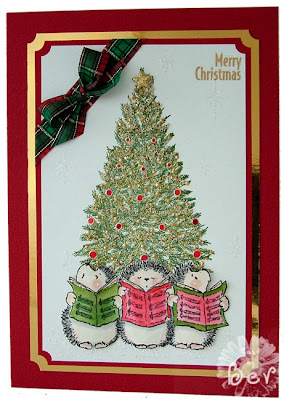 Creative Expressions tree from The Hobby House stamped in green stazon, Penny Black Carolers (also from The Hobby House ) coloured with distress inks and H2O's. I decorated the tree with Beadazzles, Stickles and peel off jewels. I then popped the hedgies up on foam in front of the tree. The sentiment is an old rub on that I found lurking in a drawer, the ribbon is also from my stash. It's Candy Time - Whiff of Joy candy! Katharina has so kindly given her DT members some rubbah to give away as candy, and more tasty candy you would be hard pressed to find especially as this stamp is currently out of stock!! So, as well as the gorgeous Whiff of Joy Willow with Hot Chocolate, I've added some ribbon, crochet flowers, flowers from Poppicrafts and Michaels wedding confetti to the candy prize. 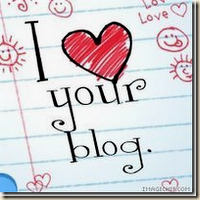 All you have to do is comment on this post and post a link to this blog candy on your blog. The candy is open to all and I will ship internationally, so if you don't have a blog, email me at bevscrafts@googlemail.com - the chance to win is open to everyone until Monday 22 September at 6 pm when I will get my grandson Ben to draw the winner again - seeing as he had such fun last time lol. I'm getting into this distressing lark and was even brave enough to *TEAR* some paper! I had to go and lie down in a darkened room, I'm still shaking now at the thought!! I've done this card for this weeks Ismaki challenge and have used this image not only cos I really love it but because ........ it's candy time again. So take a look at the sticky post above for more deets. Sentiments were done in Word. 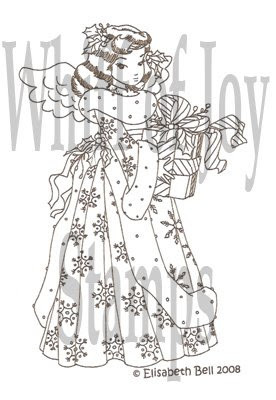 And here's a sneak peek of the upcoming release from Whiff of Joy - isn't she just darling!! I'm loving the snowflakes on her dress!!! This weeks Sarah Kay challenge is to use 3 different designer papers so I went with my trusty K & Co again. I even distressed the edges of the paper - shock!! horror!! ME distress?? And I quite liked the effect lol. 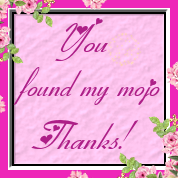 I so nearly didn't make this card for the Ismkai challenge - I thought it would be too faffy. Was I ever wrong!! I loved making it so thanks Isa for stretching me lol. Cuddly Buddly image coloured with Distress Inks and Twinkling H2O's, sentiment is Cuddly Budly too. 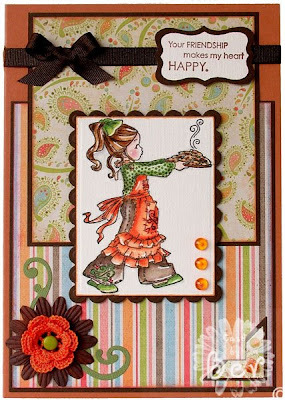 Nikki has such a fabulous sketch this week on A Spoonful of Sugar, love it!! I made the hat-pin using bits and bobs from my beading stash. Pearls - are from Sally and she has just received new stocks of the most gorgeous colours - mint, lavender, hot pink and lemon - yum!! Have you seen the Mojo Monday sketch yet? 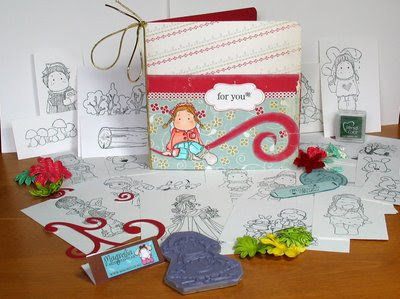 It's perfect for the larger stamps and cards so I inked up Willow with Cookies and came up with this for the challenge. I'm entering this in tis weeks Papertake Weekly challenge which is autumn, I think the colours fit perfectly lol. More Whiff of Joy blog candy up for grabs!!! Whiff of Joy Blog Candy!!! !